Tucked away in the woods on the lower side of Beaucatcher Mountain sits this lovely home! Two minutes from I-240 and five from town, this delightful, newly-renovated home is a real gem! At 2,400 sq ft, the rooms are spacious and warm. You will find the ambiance inviting and imaginatively decorated with many special touches; a super-chic/modern bathroom with "glitz"and then the classic French, old world styling of the spacious, gourmet kitchen complete with imported original artwork. Hardwood floors throughout common areas and in 2 of 4 bedrooms. 2 (Master and bunk beds) bedrooms have high-end carpeting, installed in mid-2013, which receive minimal use so they are in great shape. Kitchenette in 4th bedroom- like a separate apartment! Outdoor hot tub/spa for 6-7 people in a private spot at the side of the house. Hi! My name is Monica and thank you for reading about my precious property! I'm a recent widow in her early 60's who's been enjoying the process of transforming a home into a real beauty. . . When my husband, John, of 34 years died 8 years ago, I moved to Asheville and later bought this home. Through remodeling over the psst 2yrs, I've been able to decorate it as a very appealing and highly satisfying rental for adults and children alike! My life's work/project- my 3 wonderful adult kids and 2sweet granddaughters, were the inspiration for this remodeling project! Because I want to keep them visiting me here often, I had the incentive to make this a warm, yet "luxurious" mountain retreat! I travel occasionally but will usually be here in town at a nearby home during your stay. It's always a pleasure to greet guests and welcome them to my home, so I look forward to meeting you and showing you around the house and grounds personally- it would be my pleasure! I truly hope you Enjoy your stay- your days and nights (on the front porch with a fire!?) while you're here in lovely Asheville! I fell in love with Asheville on my very first visit and moved into a rental here 6 months later! That was in 2010. As I searched for a home close to town to purchase some 2 1/2 years later, I was drawn immediately to this lovely, picturesque spot, overlooking a pond and facing an evergreen mountain that fills the view! I knew I had to live here! So, after purchasing it in the Spring of 2013, I undertook dramatic renovations which have brought great response and delight to family and visitors alike. It's been great fun! I'm proud of the place and pleased to offer a home of this caliber so close to town... 5 minutes! Great views, large front porch, back screened-in porch, gourmet kitchen, 6-7 person hot tub and, somewhat rare among home rentals, a secluded, backyard fire pit up into the woods for conversing and roasting marshmallows! Also, if you are arriving from several directions, easy parking for up to four cars is available at the house with a seperate turnaround green space. This home is perfect for a family get-together! It also should appeal to 2-3 couples with up to 3 children, 5 with avail queen air mattress. There are 2 queen-bedded rooms 1 Bunkbed Room for 3-5 1 upstairs apt for 1-2 with a full bed, fridge, microwave and storage space for snacks! Great rec room for the kids, two. Small tv w/cable. While enjoying the Living Room, relax on the new leather sofa with extra seating. The room features a candelabra, a mountain-view and often a roaring fireplace! Piano in the dining room for music lovers~ Great neighborhood for walking, too! Three laps around the pond below is about a mile! A slow, one-way path around this pond takes you through our quiet, little neighborhood. Please observe a 10pm curfew on loud, outdoor gatherings. Revelry on the front porch or up in the acre of woods above carries an echo "heard all 'round the pond!". So do, please, respect this curfew each evening. Thanks so much! The home sits entirely in a rural mountain setting 10 mins to the Blue Rdg Pkwy. Ezy 5min drive to the twn sqr, Pritchard Park. Reasonable garages avail evry few blks. VERY artsy, hip twn, grt FOOD! Please do not enter the garage as the space is private...many thanks! Bose stereo Bluetooth speaker for your personal music source on front porch. Can be brought up to the fire pit, as well! In 4th bedroom/family room over garage- no Dvd's provided. No bikes avail at this time- so sorry! Very spacious outdoor decking, seperate hot tub area with decking and large screened in porch at the back of the house with table and chairs for dining. 1 hour away, but CALL FIRST!😃 Their availability is limited. Look up "Asheville ski" for info on local options available to you! Come get away from it all! 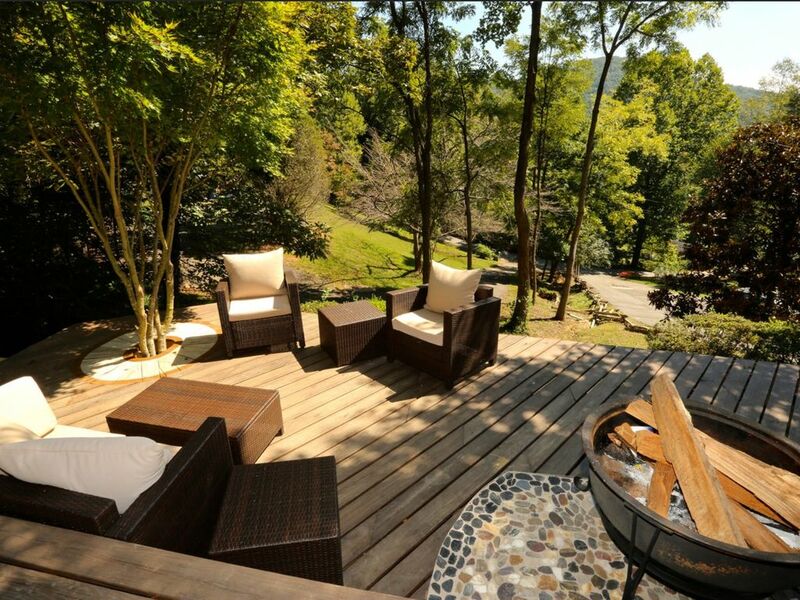 When you're not enjoying the many lovely features of this home a few minutes from town, explore Asheville! Golf and tennis are 10-15 mins away, the Blue Ridge Parkway offers an outstanding scenic drive and is 10mins away also. The Biltmore Estate is 15-18 mins just southeast of us off I/40 here in Asheville. It is not fancy, but perfect for a large group. Lots is seating and root kitchen. Was a nice venue for our girls trip as we all fit in the living room and around the kitchen island. This is a beautiful home in a superb location. We thoroughly enjoyed our stay. Thank you. This home was a perfect gathering place for us, our adult children and our young grandchildren. The house was immaculate and accommodated all three (3) of our families. Very close to all the wonderful activities Asheville has to offer, downtown, the Biltmore, WNC Nature Center and Wolf Ridge for tubing and skiing. The grocery store was minutes away and some excellent restaurants. Thank you Monica for the wonderful home and the opportunity for a thoroughly enjoyable family gathering. David & Kathy. Perfect place to come home to! We were in Asheville for a family wedding. This was the perfect place for all of us. We gathered on the front porch (even in rain, as seating area is covered) around the fire as everyone arrived from around the country and again after festivities each night. We also started several days with coffee on the front porch in front of the fire, so peaceful. There were places to gather as a group and places to go and be alone. The house had everything we needed, plenty of linens, supplies, comfortable beds and a VERY well appointed kitchen. We appreciated the nice appliances! Monica was great. We had to call her for some little things (light switch) and she responded right away. She was so lovely and friendly to work with. Location is also great. Uber drivers knew right where it was. It's 15 minutes from the airport, 10 minutes from downtown Asheville, 10 minutes from Grove Park and close to hikes and so much to do. Yet, it is a very private feeling looking over the trees and lake. This was a great house with a very convenient location and we enjoyed our stay here. If you are looking to spend a weekend in the mountains this is your place. Perfect in every way! Location, access, tucked away in a woodland mountain setting! Every amenity was well in order and Monica was a gem of information and assistance. Close to west end, close to downtown, easy access to BRP and many trails for hiking, waterfalls, and amazing vistas! This was my first VRBO stay, and it was perfect for our family weekend getaway. With my 2 boys we were 3 adult couples. Rooms were large and comfortable and plenty of towels are provided. I don't know if this is the norm, but the kitchen had lots of spices and basic cooking necessities, and the bathrooms had body wash and shampoo and conditioner. One thing mentioned we didn't find was a hair drying, though there were 2 hair flat irons. The location was ideal, with easy access whether we were headed downtown into Asheville, over to tour the Biltmore, or up to the Blue Ridge Parkway and Mount Mitchell. The weather was so warm we didn't get to enjoy the firepit, but we did take one night for the hot tub, which was lovely. We recommend something be done to boost the internet speed, which was quite slow. Also while the kitchen was quite well stocked for things like plates, glasses, and pots, the knives in the knife block were not very sharp, and the variety of mixing bowls limited. Many of the cooking utensils were OK for non-stick coated cookware but a bit flimsy for use on stainless steel. We had some trouble getting the grill to light, but my son has a similar one so he was able to figure that out. The setting is peaceful and secluded, great for enjoying coffee in the morning or relaxing at the end of a busy day. We used ride share into downtown Asheville a couple of times and the drivers had no trouble, though the driveway is very steep so we met them at the bottom of the driveway. Even a limo was able to bring us in, as it appeared he'd been to that house before. Monica was great at staying in touch, and responsive to our questions. If we find ourselves in Asheville again we will certainly consider this property. I can’t tell you how much I appreciate your very helpful critique of the house and it’s furnishings! This was exactly what I needed to hear and I are you a debt of gratitude! Will increase Internet speed and get new knives, mixing bowls and utensils. Thanks for your help! Hope your trip home was pleasant and safe! Thank you again, Renne, for your suggestions! Though it's 5-6 mins to town by car it's a hilly, 20-25 mins on foot-I don't recommend it. A taxi would cost $15-20 rd trip. Uber runs slightly less, I've heard. But your best transport is having your own car for multiple daily trips in nearly any direction. The area offers rolling hills and small, picturesque valleys along with mtn views available to the north and south of Asheville along the Blue Ridge Parkway. If you just need to "veg-out", do it on the front porch with a multi-hued mtn offering up an undeniable, "Welcome Home! ".